It was time to go! Mooring for any length of time gives us itchy feet and this is starting to become a very familiar portion of the canal network. Hopefully we will be able to commence cruising onto new waters very early next year. Meantime, we headed back north to top up the pantry. 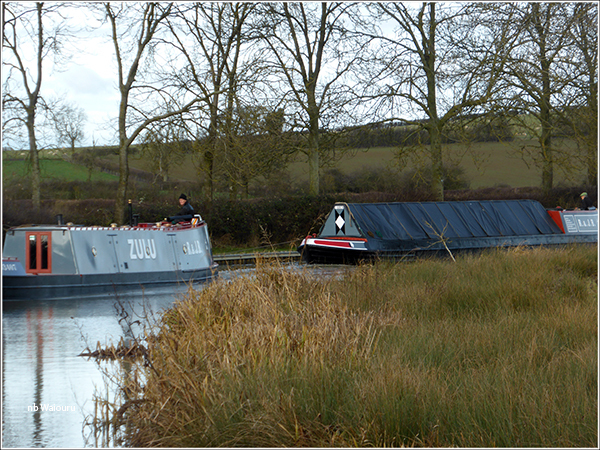 After filling the water tank and disposing of the rubbish we cruised out of Braunston on tick-over passing Maffi & Molly. We might just see him next year. As we passed Muleless Della appeared at the side hatch with camera. There was just enough time for me to comb my hair and lick my eyebrows. Jan hid! Gary wanted to know the height of our diesel stove (a conversation from the previous day). I told him it was 20 inches and he immediately grinned. Theirs is 23 inches and I’d claimed both stoves were the same height. Obviously I was wrong erred in my judgement! It was warmer than yesterday, although the sun didn’t put in much of an appearance. The canal is quieter at this time of the year and we must have passed less than half adozen boats going in the opposite direction including Zulu towing the butty as usual. We last saw them leaving Braunston as we headed towards Calcutt. Around bridge 82 Jan noticed some of the local dog walkers have been placing Christmas decorations in the towpath trees and hedgerows. All those coloured plastic bags. It’s only at this time of the year when the foliage has gone that you get the full colourful effect. 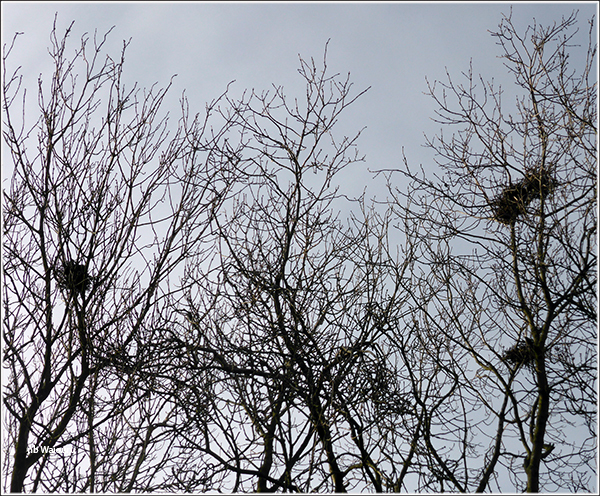 Another thing you get to see at this time of the year are the empty bird nests high in the trees. We weren’t travelling fast and Jan decided there was sufficient time to make a cake before we reached Hillmorton Locks. She had found a recipe for a custard cake (custard powder instead of eggs) Shortly thereafter delicious smells started to waft out the back doors. On reaching the top of the flight we noticed Oakfield moored just above. No sign of curtains twitching so Keith was probably embracing the keyboard. 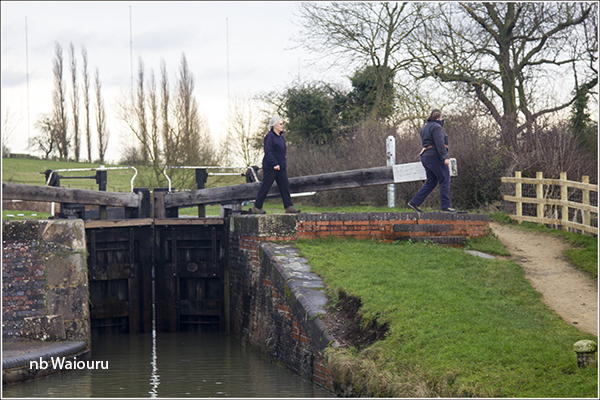 As Jan was setting the lock a lady walker appeared in the distance. It was Ann who had been out for a walk. She kindly assisted us down the lock whilst simultaneously managing to hold a conversation with Jan. Females can multi-task! The gates on the middle pair of locks don’t appear to be leaking as badly compared to our last transit several weeks ago. Perhaps CRT have adjusted them? We slowly continued on to the quiet golf course moorings; where there was only one boat; and decided to stop. The batteries were at 100% and the sky was starting to look ominous.